Young people want to learn from young people! 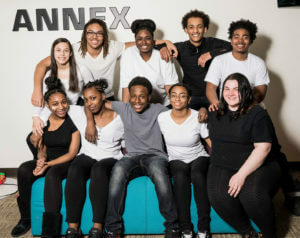 The Annex Advisory Council is a youth leadership, advocacy, and peer education group that serves as a catalyst for education and change around sexual health in their communities. They are our go-to group for advice and feedback about our services. The Annex Advisory Council meets at Armstrong High School one day a week after school. New members can join at the start of the school year and must be in high school. If you are interested in joining or learning more about the group, please get in touch with Harmony Slabchuck at harmony@annexteenclinic.org. The CRUSH Youth Leadership Council is a group of young leaders who provide advocacy, outreach, and education about sexual health. Their work the past few years has included educating their peers about the importance of getting tested for sexually transmitted infections, planning community events, and speaking out for the importance of taking charge of one’s sexual health. They meet once a week during the summer and twice a month during the school year at our office in North Minneapolis. New members can join at the start of the school year and the start of the summer. Must be under 18 years old to participate. If you are interested in joining or learning more about the group, please get in touch with Trina Pearson at trina@annexteenclinic.org. This group of young people ages 18+ work on outreach and peer education via social media and tabling events in the community and on college campuses. If you’re interested in learning more about joining the digital team, contact Harmony Slabchuck at harmony@annexteenclinic.org.